Fill a large pot with about an 1 inch of water, place steamer basket in pot and bring water to a boil. (If you don’t have a steamer basket, you can boil the beets for about 15 minutes or until tender when pierced with a fork.) Once water is boiling, lower to a simmer and add beets. Cover with a tight-fitting lid and let steam for about 10 minutes or until tender when pierced with a fork. While beets are steaming, in a small bowl, whisk mustard and lemon juice together. Set aside. Remove beets from pot. Let cool, peel and chop into bite-sized pieces. 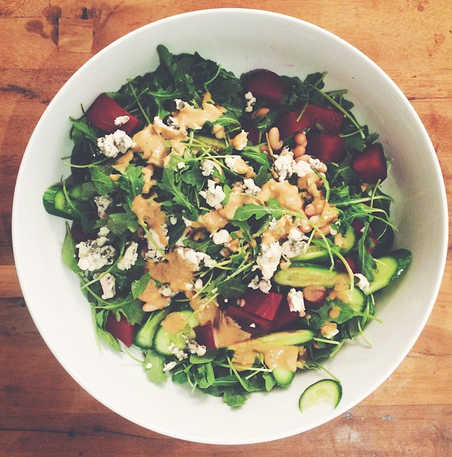 In a large bowl, add arugula and cucumbers, beets. Top with roquefort cheese, dress salad and serve immediately.